Collections Etc, online at CollectionsEtc.com, is your one-stop shop for home and garden decor, gifts, holiday items, clothing, accessories, and more. Almost everything at Collections Etc is less than $19.99, which makes for a bargain-filled shopping experience. Collections Etc makes gift-giving easy, by offering products for every season, room, and family member. 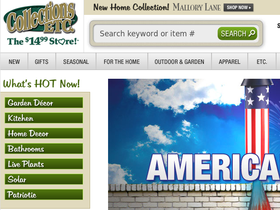 Outdoor lighting, bags, wallets, bedding, and figurines are just a small sample of what you can find at Collections Etc. Just check RetailSteal.com first for the best Collections Etc coupons, Collections Etc coupon codes, and Collections Etc promotions. Collections Etc ships within the Continental U.S. and Alaska, Hawaii, Puerto Rico, and other U.S. Territories. Allow 7-10 business days for standard delivery. Return item within 100 days and receive a refund. See merchant's site for full details, exclusions may apply. Sign up for the email list at Collections Etc. and save 15% on your purchase made online. Use this coupon code at Collections Etc and enjoy a 20% discount on your order. Click link now. Take 15% off your first purchase at Collections Etc when you use this coupon code and sign up for emails. Click link now to shop. For a limited time, enjoy free shipping on your purchase of $45 or more at CollectionsEtc.com. Click link now and use coupon code to save. Act now and take advantage of $1.99 shipping on your order of $50+. Use coupon code at checkout to save. Click link to shop the sale section at CollectionsEtc.com and you'll find a wide range of decor and home goods up to 80% off. Become a member of the Green and Gold Savings Club at Collections Etc and you'll get to enjoy 10% off every purchase for a year. Shop sale at Burpee online for up to 75% off top products. Check out Burpee online for their latest special offers.